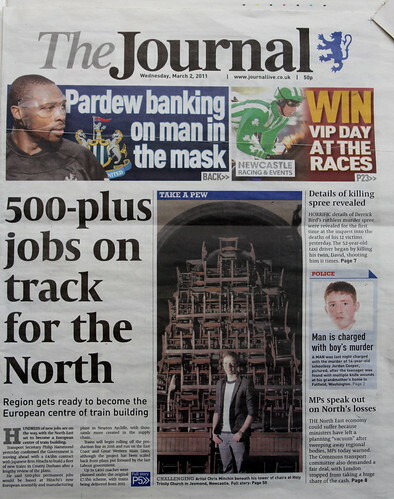 By David Whetstone, The Journal arts editor. DRAWINGS inspired by alarming YouTube footage purporting to show an exorcism in America feature in a church artwork. But they are not the only arresting aspect of Chris Minchin’s installation at Holy Trinity, Jesmond, Newcastle. 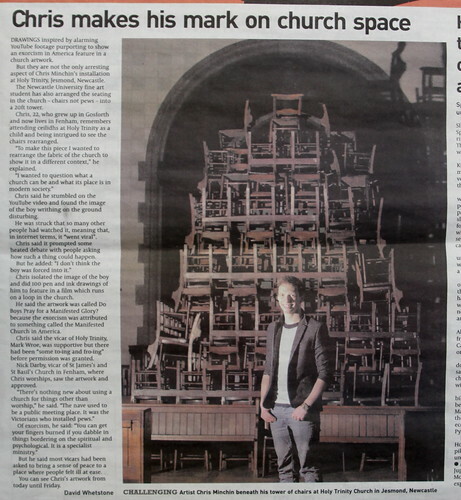 The Newcastle University fine art student has also arranged the seating in the church – chairs not pews – into a 20ft tower. Chris, 22, who grew up in Gosforth and now lives in Fenham, remembers attending ceilidhs at Holy Trinity as a child and being intrigued to see the chairs rearranged. “To make this piece I wanted to rearrange the fabric of the church to show it in a different context,” he explained. Chris isolated the image of the boy and did 100 pen and ink drawings of him to feature in a film which runs on a loop in the church. He said the artwork was called Do Boys Pray for a Manifested Glory? because the exorcism was attributed to something called the Manifested Church in America. Of exorcism, he said: “You can get your fingers burned if you dabble in things bordering on the spiritual and psychological. It is a specialist ministry.” But he said most vicars had been asked to bring a sense of peace to a place where people felt ill at ease. You can see Chris’s artwork from today until Friday. March 7, 2011 | Filed under Press and tagged with 2011, animation, babel, chairs, chris minchin, christopher, do boys pray, front page, holy trinity, manifested glory, press, the journal, tower.